We have a stunning range of luxury dog dining products. 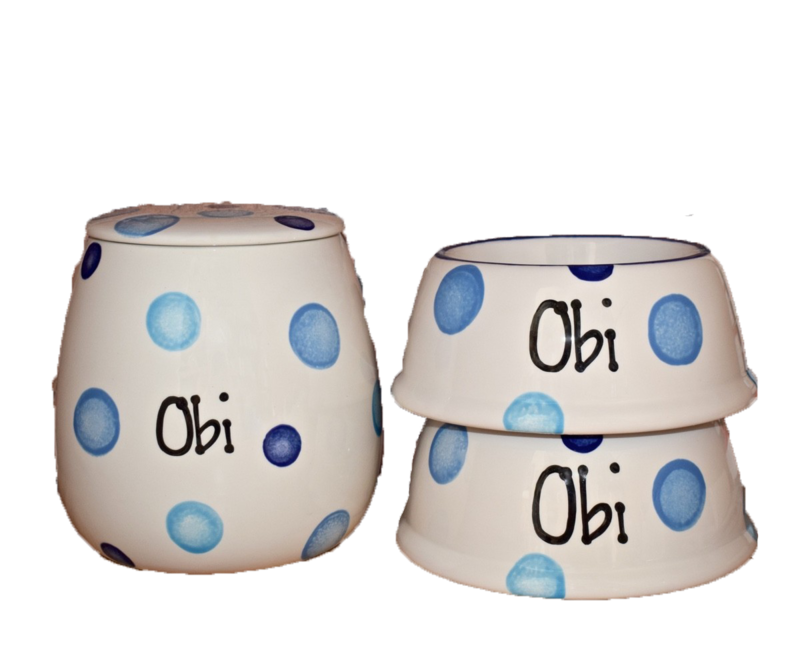 Our ceramic dog bowls are not only handmade to order but they can also be personalised with your dog's name and they are made exclusively for Chelsea Dogs. Our lovely potter also makes spaniel dog bowls to keep those long ears from getting full of food and water. Our raised dog feeders can be painted in any bespoke colour. Dinner time is one of the most important times of the day for your dog so make sure you are not only feeding him the best food but also giving him the best bowl to eat it out of. At Chelsea Dogs we have a complete range of ceramic dog bowls, treat jars and spaniel bowls all handmade to order for us here in the UK by our exclusive potter. All our designer ceramic dog bowls can be personalised with your dog’s name before they enter the kiln for a final firing. We also have some lovely raised dog feeders made from wine boxes imported straight from the finest vineyards in France. Our other raised dog feeders include those made to order for us in the UK by expert metal workers who can also create a completely unique dog feeder for you from a sketch you can submit to us and we’ll do the rest! If you take your dog traveling with you or even if you are a keen outdoor explorer, make sure you have a look at our travel dog bowls that are perfect for taking out and about with you.